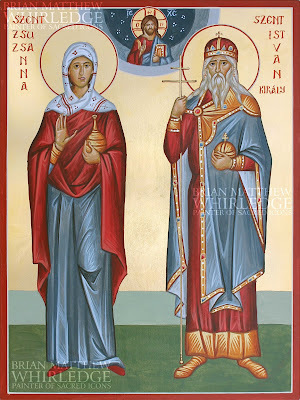 Saints Susanna the Myrrhbearer and Stephen of Hungary. Acrylic and gold on gessoed birch panel. 9x12"
This family icon depicts Saints Susanna the Myrrhbearer and Stephen of Hungary. This icon was commissioned for a friend's grandparents who were displaced from their native Hungary during World War II and eventually settled in America. This icon features their patron saints, St. Susanna the Myrrhbearer, and St. Stephen the first King of Hungary. St. Susanna is mentioned in the gospel accounts as one of the myrrhbearing women who came early in the morning to anoint Christ and instead found the empty tomb. St. Stephen (Istvan) united the Hungarian peoples into one kingdom and baptized them in the Christian faith, much like St. Vladimir for the Rus. He fell asleep in the Lord in AD 1038. His crown in this icon is based on his actual crown, which still exists and is displayed at the Hungarian Parliament in Budapest. The Seven Holy Sleepers of Ephesus.